Let’s face it– Fort Bend is fascinating. From a state-of-the-art minor league ballpark to a world famous rock star to annual fundraising activities that raise millions, Fort Bend has it all. As Fort Bend Focus Magazine celebrates our 100th issue this month, we decided to take a look at what makes our community what it is – unique and yes, fascinating. As in our mission of covering people, places and happenings, that’s where we will shine the spotlight on the fascinating aspects of the Bend. 1 LARRY WADE CARRELLAfter growing up in Fort Bend, Larry Wade Carrell has made it a point to use his familiar local surroundings as the backdrop for all of his movies. An award-winning filmmaker in his own right, Carrell’s last film, Jacob, received excellent reviews not just for its compelling story, but for the localities in Richmond and Rosenberg that served the story so well. Always one to appreciate his home and where he came from, Carrell takes great pride in everything from his films, including Betty Vega’s “Dairy Treat” on the strip. Fort Bend will always be his pride and joy! 2 THE TRIUMPHSThis nine-piece, Rosenberg-based band has roots that go back to the early days of rock ‘n roll and also launched the career of five-time Grammy award winner B.J. Thomas. They had several #1 hits on Houston’s KILT top 40 Survey in the early 60’s including Lazy Man, I Know It’s Wrong, I’ve Got a Feeling, Billie and Sue, recorded the still popular Garner State Park (which is still played nightly at the Garner dance pavilion) and, of course, recorded the #1 song in the nation in 1966, I’m So Lonesome I Could Cry just prior to B.J. beginning his solo career. The band, which began in 1959 in a garage, continues to perform regularly in and around Fort Bend. 3 FRANK BEARDFrank Lee Beard is the drummer in the American rock band ZZ Top. Beard was born in Frankston, Texas and in 1969 joined the famous group with guitarist and vocalists Billy Gibbons and Dusty Hill. After honing their trademark Texas boogie-blues-rock style, their first album was released in 1971. It’s interesting to note that although his last name is Beard, he is the only member of ZZ Top who doesn’t actually wear a beard. He currently resides in Richmond where he owns and operates the Top 40 Ranch and can often be seen playing golf in tournaments and community events around the county. 4 BENJAMIN FRANKLIN TERRYBorn in Russellville, Kentucky, Benjamin “Frank” Terry (1821-1861) was the son of Joseph and Sarah Terry. After his parents separated, Sarah moved her children to Texas and settled with her brother. She and her brother died leaving Frank to support his family, and he partnered with William J. Kyle in 1851 to build the first railroad in Texas. By 1856, the tracks reached the Brazos some thirty miles from Harrisburg. Terry became a successful businessman as he continued contracting to build railroads and made a profit on the Oakland Sugar Plantation he purchased located in Fort Bend. He became a leader in Fort Bend County by organizing and serving as the first commander of the Eighth Texas Cavalry Terry’s Texas Rangers for the Confederate Army, and he died for his state with top honors. 5 BEV CARTERBev Carter is the owner and publisher of the Fort Bend Star newspaper and has won numerous state and national awards for her work. She has been the people’s voice for Fort Bend’s largest circulated newspaper for over 30 years. Having founded the Fort Bend Star in 1978, county residents have consistently been able to obtain in-depth reporting from the straight shooting Carter. News without spin has always been the norm from Bev Carter and her weekly newspaper column, affectionately known as Bev’s Burner. Bev has been interviewed on the television shows 48 Hours and 60 Minutes for her interesting views on Fort Bend. The work of highly acclaimed Texas-based sculptor Bob Pack has been collected worldwide. His energy level and artistic abilities appear boundless as the life-size and large bronze monuments he so meticulously sculpts. Pack’s work can be seen in numerous places around Fort Bend including Sugar Land Town Square’s statue of Stephen F. Austin and the Richmond City Hall, which features a statue of longtime Richmond Mayor Hilmar G. Moore. His work often depicts wildlife in natural positions that show off the spirit of the subject. Pack currently resides in Fort Bend County. George is perhaps the most famous last name in Fort Bend. Albert and Mamie George are names synonymous with generosity and love for fellow man. They were both descendants from the early pioneers; colonists rooted in Texas soil who worked hard to keep their heritage alive. They married in 1886 and built the home that still survives today on George Ranch. Tragedy struck the Georges in two ways. First, their only son, Davis, died in 1899 of infant cholera at only 22 months. Then in 1943, Mary Jones, the daughter of Mamie’s cousin who lived with the Georges since childhood, was killed in an automobile accident. This tragedy moved them to start the George Foundation in 1945 to make sure their wealth would benefit the citizens of Fort Bend. Steven, Mark and Diana Lopez are affectionately referred to as Sugar Land’s “First Family of Taekwondo.” Each of them medaled in their individual taekwondo events during the Beijing Olympics, with Mark having won the silver medal while Steven and Diana each won the bronze medals in their individual weight classes. They made Olympic history as the first three siblings to medal in the same games. When they each qualified for the Olympics in Beijing, they became the first set of three siblings since the 1904 games to have been on the same Olympic team. And, it truly was a family affair as the trio was coached by their older brother Jean. When you think of giving in Fort Bend, one name immediately comes to mind: The George Foundation. But equally as familiar as the foundation, there’s another name that is synonymous with giving and has become an institution herself in Fort Bend. It is the woman who has been at the helm of The George Foundation for over twenty years, and the woman who has touched virtually every community organization through her giving, volunteerism and leadership: Dee Koch. If Fort Bend had royalty, its reigning queen would be Billie Harris Wendt. Since the Civil War, the Harris’ have claimed Fort Bend as home and have laid a foundation of education and service to our community rich in preserving our heritage and history. From heading up the Lone Star Stomp benefitting the Fort Bend County Museum Association to serving as the first female board member at Polly Ryon Hospital, now OakBend, Billie has made her mark in giving in Fort Bend. If you’ve ever attended a Fort Bend Junior Service League event, odds are this JEWEL has had a hand in it. From serving on the PTO to heading up the Sugar Plum Market to receiving the League’s Volunteer of the Year in 2004, KK West has devoted much of her time to helping others. “My family inspires me,” said KK. “I know that I have been led to give in this wonderful community full of compassion, concern and consideration for others.” And give, this JEWEL does. In December of 2012, Fort Bend lost one of its JEWELS. Billie Neuhaus devoted her life in Fort Bend to giving from heading up committees at the Fort Bend County Fair to being active in politics to driving a school bus in Sugar Land when the transportation program was young and in need of some assistance. If Billie could help, she did, and while doing so, she made an indelible mark on Fort Bend. Now, this JEWEL’s star shines brightly in heaven. “The single most important thing in my life is to have raised a family that cares deeply about others and does something about it.” That’s the philosophy of Ann Smith, and this JEWEL has accomplished what she set out to do. Each year, Ann heads up the ARC’s “Best of the West” with her two longtime co-chairs and family at her side. Giving truly is a family affair to the Smiths, and with Ann at the helm, this tradition of giving is secured for generations to come. Giving has been at the forefront of this Richmond family for generations, and Lizz Sansone carries on the family tradition well. With a passion for leaving a better community for the future, this Fort Bend Junior Service League member has touched many through her work with the League, the Literacy Council of Fort Bend and Common Threads. As past president of the Literacy Council, Lizz believes the impact that service can make in someone’s life. “Service makes a positive difference in people’s lives,” said this JEWEL. We couldn’t agree more. It’s all about the kids with this JEWEL who has a passion not only for her work as a pediatric dentist, but a passion for helping others where she lives and works. A staunch supporter of children’s organizations including Casa de Esperanza, Child Advocates and Girl Scouts, May is a board member of OakBend and led the American Red Cross Super Ball team to victory for many years with their annual fundraising event. “I can cite over and over many people who serve as fantastic role models for my children,” said this JEWEL and mother of two. Her girls – and our community – need only to look to May when searching for role models. Born and raised in Rosenberg, this JEWEL is homegrown and has devoted her life of giving to the county she calls home. From 4-H to FFA to the Fort Bend County Fair, Donna Kay’s commitment to community has deep roots. While agriculture has been her passion, she is a staunch supporter of the Fort Bend Museum, the Rosenberg Railroad Museum and ARC. “Our family motto is ‘When you are serving your fellow man, you are serving the Lord.’ I try to help anybody I can,” said Donna Kay. And help, she does. This JEWEL has spent her entire life supporting the community she loves – the community where she and her partner of sixty plus years chose to live, work and raise their children. Mother of five, Carolyn Banfield belonged to every PTA board for her children and at one time, served as president of each. Education is and was her passion for giving. A longtime supporter of the Lamar Educational Awards Foundation (LEAF), Carolyn assists with awarding grants to LCISD teachers by boarding the bus to deliver the good news – and checks – to deserving teachers. “The bus ride is the highlight of my year!” said Carolyn who plans to be on that bus for many years to come. Choir director, Girl Scout, producer and First Lady of Sugar Land all describe this JEWEL who has spent much of her life in Fort Bend doing what she was raised to do: serve her community. Peggy Duggan directed her church choir for twelve years and produced a Christian musical at Dulles High School Auditorium. An original board member of the Tri-Cities Resale Shop, Peggy has spent her life in service to others. “You can never replace the joy in your heart that you get from giving. It comes back to you one hundred fold.” Well said, First Lady. The only JEWEL to give birth just in time to walk down the runway at the annual event, Brigit Engleman gave birth not only to baby Cade but to a heartfelt commitment and passion to help others. From the Fort Bend Junior Service League to Child Advocates to The Make-A-Wish Foundation, Brigit has already made a huge impact on our community during her young life. Awarded the “Blue Ribbon Award” by Child Advocates for her work as an advocate, Brigit’s heart belongs not only to her two sons, but to all children. “It’s very rewarding when you are able to work collaboratively to close a case with a happy ending for a child,” said Brigit. With Brigit on their team, children in need will have many more happy endings to look forward to. From assembling backpacks for Child Advocates children for back-to-school to chairing the first gala for the Fort Bend Education Foundation, this JEWEL gets it done. A Vacation Bible School teacher for over twenty years, Lynn Halford’s passion is children and education. “I’ve never regretted anything that I’ve given,” said Lynn. “I love to volunteer.” Lucky for Fort Bend, Lynn loves to volunteer, and she does so extremely well. If you have been to a fundraising event in Fort Bend, chances are you’ve been personally touched by this JEWEL’s generosity, hospitality and community spirit. Cassandra Wen and her husband, Allison, purchased a little 44-acre ranch and have turned it into a staple of giving in our community: Safari Texas Ranch. 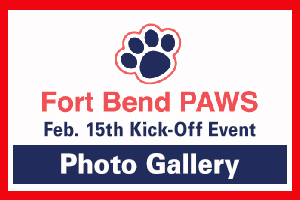 A quick glance on the calendar will reveal that there are not many fundraising events in Fort Bend that are not hosted at Safari Texas. Why? Because of this JEWEL’s philosophy: “Community is so important. We always wanted to give back to the community with this place.” And give, she does. For over 70 years, this JEWEL has made Fort Bend her home, a home filled with people she describes as “the friendliest and most generous you will ever find.” From the Lamar Educational Awards Foundation to scouting to the Rosenberg Railroad Museum, Doris Gurecky has led major fundraising efforts in the community she loves. When the City of Rosenberg built a Regional Sports Facility but couldn’t afford a concession stand, this JEWEL stepped in. Today, Little Leaguers have a concession stand thanks to the Gurecky’s generosity and giving spirit. If you’ve been to the county fair, a local political event, a Girl Scout meeting or even the Lone Star Stomp, odds are you’ve met this JEWEL. From starting her HOA newsletter to running political campaigns to serving as a board member for Fort Bend Seniors, Pat Hebert knows the importance of community and teamwork. “No one person can do it all, but if we all work together, we can make our community a better place.” Mission accomplished, Pat. With a passion for serving children, this mother of three has headed up events for the Fort Bend Junior Service League and the CASA Christmas Home Tour. Despite the long hours and crazy schedule of event leadership, Cari Middaugh tackles community service projects with both passion and pride. “If I can just help out a little bit, it’s worth the hard work and long hours it takes organizing these events, because I know the money is going to help so many in need,” said Cari. Texas women are resourceful, spunky and above all else, a force to be reckoned with, and this JEWEL is the epitome of a Texas woman. Educator, author and advocate, Judy Schmid’s commitment to community has spanned over thirty years helping a very special group of people at the Richmond State School. Now called the Richmond State Supported Living Center, this unique facility serves people with intellectual and developmental disabilities. “I want people to know that I truly care about people, my community, my faith, family and country,” said Judy. Fort Bend knows that this JEWEL not only cares; she does something about it. With a passion for literacy and education, this JEWEL works tirelessly to achieve her dream: “My home and dream for the future is that every child would have the opportunity to succeed in school and in life.” From her work in adult literacy at the Literacy Council of Fort Bend to starting up ACHIEVE Fort Bend committed to dropout prevention and recovery, Lucia Street’s commitment to education spans over forty years when she helped develop the 1 to 1 Tutoring Program at Lakeview and Dulles Elementary Schools to help children get off to a good start in their elementary years. This JEWEL has done her homework. A history buff at heart, this JEWEL has spent her time in Fort Bend caring and sharing many gifts, but one stands out above all of the rest: the gift of hospitality. Sandra Billingsley readily volunteers to host meetings, cook meals and organize food for many organizations from the Fort Bend County Museum’s events to Lunches of Love where she makes lunches for children in need. In the Lamar Educational Awards Foundation’s annual “Surf’s Up” fundraising event, Sandra regularly bakes beautiful cakes that fetch thousands of dollars. This JEWEL spreads her love of community through food and good, old-fashioned hospitality, and we’re glad she does! An advocate for Fort Bend who has spent countless hours working in the community, this JEWEL has held many titles. From Sugar Land Mayor Pro Tem to Councilmember to President of the Fort Bend Boys Choir, Jacqueline Baly has touched numerous organizations with her time and talents. An ABC 13’s Women of Distinction Award winner, Jacqueline regularly emcees community events and has served on the boards of several community organizations. A recipient of Fort Bend Entrepreneur of the year, this JEWEL not only knows the importance of a strong community, she works tirelessly to make sure hers is one of the best. Don’t blink, or you’ll miss this JEWEL of Fort Bend who snaps photos at virtually every community event. Mary Favre’s role “behind the camera” is just a small part of what this JEWEL does to serve her community. From Child Advocates to Casa de Esperanza to Sugar Land Cultural Arts, Mary’s passion for community runs deep. “I work to seek opportunities to encourage citizens to become involved by utilizing their unique gifts and talents,” said Mary. For using her talents and making community service a part of her “big picture,” Fort Bend is grateful to this JEWEL. Whether it’s chairing an event or helping out at her children’s school, it doesn’t take long to realize why this JEWEL has been dubbed a “Golden Volunteer” by the Fort Bend Junior Service League. In addition to serving as an officer of the League, Melissa Hayslip has served on event committees for the American Cancer Society, the Fort Bend County Women’s Center and on the PTO board at her children’s school. “I’ve been told that Fort Bend is a non-profit mecca,” said Melissa. “I think this is a great thing because it means that we live in a community that is willing to give back and support all of our non-profits.” Fortunately for our community, we have JEWELS like Melissa to step up to the plate. Many people take family vacations each year, but for the past several years, this JEWEL has gone on another type of trip regularly: mission trips. Kathy Huebner has traveled to Guatemala at least 16 times on Faith in Practice mission trips where she and her husband serve as medical missionaries to assist Guatemalans with their medical needs. But her community service doesn’t end there. Kathy volunteers with The Community Cloth, an organization dedicated to empowering refugee women in Houston through enterprise, and she is the Coordinator of Merry Ministries, an ecumenical Bible Study of over 400 women at Sugar Land First United Methodist Church. A heart of service and devotion summarily describes this JEWEL. The Sugar Land Skeeters are an American professional baseball team based out of Sugar Land. They are members of the Atlantic League and began playing its home games at Constellation Field. After a lengthy team-sponsored fan poll, the public chose the name “Skeeters” for their team due to the common finding of mosquitoes in Fort Bend summers. The Skeeters are the first independent league baseball team in the Houston area since the Houston Buffaloes’ final season back in 1961. An international award-winning film-maker, Wayne Slaten is a name synonymous with cinematic success. Slaten’s first film, Backroad, was shot in and around Fort Bend County and tells a rather compelling story of a man’s struggle with his own identity. Constantly on the lookout for film shooting locations throughout the county, Slaten loves showing off the architecture and hospitality of the local citizenry. Slaten’s next project, Patriot Act, is now in the midst of shooting in both Harris and Fort Bend Counties and will be a major blockbuster in the feature film arena. Jennifer Nettles and Kristian Bush comprise the American country music duo of Sugarland. Breaking into the music scene in 2002, the group decided to name themselves after the city of Sugar Land, due to the “sweet” sound the city had to it that came about from the Imperial Pure Cane Sugar factory that was headquartered here. Nettles liked the “sweet” name even though the group hails from Georgia. The Grammy-award winning group has received numerous nominations and recorded a song, Guide You Home, for the 2012 movie, Act of Valor. Sugar Land resident Tom DeLay is a former member of the U.S. House of Representatives having represented Texas’ 22nd congressional district from 1984 until his resignation in 2006. He served the Republican Party as House Majority Leader and was affectionately referred to as “The Hammer” for his staunch enforcement of party discipline and retribution against those that didn’t support the legislative agenda of President George W. Bush. DeLay was one of the most powerful forces in Washington and was responsible for putting Fort Bend on the DC radar screen. DeLay was convicted of wrongdoing in connection with campaign finances and was sentenced to three years in prison. He is appealing his conviction. Crystle Danae Stewart from Missouri City is an American beauty pageant titleholder who won Miss USA 2008. Stewart showed tremendous resiliency as she competed numerous times around the pageant circuit, finishing close to the top in each attempt until her win in 2008. She graduated from Elkins High School and holds a degree in consumer science and merchandising from the University of Houston. Stewart shot even further to stardom having won the role of Leslie, a well-off real estate agent, on the TBS comedy television series, Tyler Perry’s For Better or Worse. At the age of 23, Rosanna Pace was crowned the 53rd annual 2012 Miss Rodeo Texas. Pace grew up in Richmond and has a Bachelors degree in Art Communication. She is currently pursuing a Masters in Curriculum and Instruction at Texas A&M University. Pace isn’t new to winning competitions, as she owns many awards including serving as the Fort Bend County Fair Queen in 2005. Award-winning columnist Alisa Murray created an original column, The Sweet Life, in Fort Bend Focus Magazine over five years ago. With her column, Murray writes of her life experiences – and lessons – in a poignant and uniquely southern manner. Originally from North Carolina, Murray lives in Fort Bend where she is a well-known portrait artist. Through her Medicine and Arts series of works, Alisa has published calendars featuring cancer survivors benefitting the American Cancer Society and The Snowdrop Foundation. Fort Bend Christian’s Lady Eagles are on the greatest winning streak in the school’s history, and as of mid January, district play had not even started yet. The Lady Eagles are currently 33-0 on the season and have five tournament championships under their belt. Coached by Jon Froelich, Brad Simmons and Cieara Watts, the varsity squad of 15 is currently Fort Bend Christian’s most successful sports team. After winning a 67-27 non-conference game against Woodlands Christian on January 2nd in the Toyota Center, the Lady Eagles entered district play on January 11th with an unbelievable record that is sure to improve throughout the season. In a male dominated society, Jane Long (1798-1880) set an example for all women of her time to be strong and self-sufficient. Born in Maryland, she moved to Natchez after the death of her parents. Jane met James Long, married him on May 14, 1815 and gave birth to Ann. As time went on, she lost two other children. James died in 1822 after being captured by Mexican forces, and Jane never remarried. At age 39, she opened a boarding house in Richmond and purchased a plantation. She bought and sold land, raised cattle, grew cotton and became a very successful business woman. In 1936, a centennial marker was erected in her honor. She is considered “The Mother of Texas” by many. Hilmar Guenther Moore was appointed Mayor of Richmond in 1949 and held office until his death on December 12, 2012. Born in San Antonio and raised by his parents, Dorethea and John Moore, Hilmar lived his whole life in Richmond attending high school there and graduating in 1938. He attended college at the University of Texas in Austin majoring in law and was a member of Kappa Sigma fraternity. He joined the U.S. Air Corps in 1942 earning several Medals of Honor. He returned to Richmond in 1946, and three years later was appointed Mayor of the city to fill an unexpired term. Mayor Moore won 32 consecutive elections for two year terms, a total of 63 years in office, and he is believed to be the longest serving mayor in the United States. The widow of Mayor Hilmar Moore, Evalyn was born in 1943. Her family was instrumental in the development and growth of the area for generations. On Monday, December 17, 2012, Moore was sworn in as Richmond’s new mayor and is serving the unexpired term of her late husband. She is the first woman to serve as Mayor of Richmond. Moore has contributed many years of service to her community as President and docent of the Fort Bend County Museum Association, a trustee of the Southwest Cattle Raiser’s Association, an officer in the Richmond Garden Club, a board member of OakBend Hospital and active in Friends of the Fort Bend County Historical Commission. Her first term expires May 2014. The accolades are impressive. According to a study by Rice University in March 2012, Fort Bend County is the most diversified of the five largest counties in the Houston Metropolitan area with Missouri City named the most diverse city. It is the regional leader in ethnic diversity and in High School Graduation rate by the U.S. Census Bureau – American Community Survey, with the lowest cost of living among major metropolitan areas. It is forecasted Fort Bend will lead the region in job creation, averaging more than three percent growth per year through 2015. 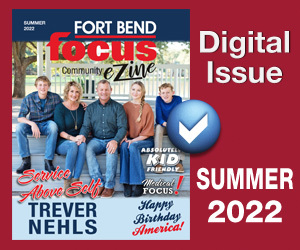 Each year since 2006, Fort Bend Focus Magazine has selected a gent from Fort Bend County and dubbed him as Man of the Year. What makes someone a Man of the Year? Check out our Man of the Year Hall of Fame and see for yourself. Giving with a focus and purpose sums up Bob Brown’s philosophy on community service, and he is intent on giving in the community where he has chosen to live and work. “If the check is cashed outside of Fort Bend County, well, it just won’t happen,” said Bob. Bob has either donated to or served on the board of nearly every philanthropy in Fort Bend. But perhaps Bob is best known for his vibrant participation in auctions. If Bob buys it, chances are he’s going to make the donation and donate the item back to sell a second time, doubling the money for the charity. Now that’s how you double down! Jeff Wiley, President of the Greater Fort Bend Economic Development Council, said it best. “Safari Texas Ranch is a wonderful asset in the community, but it is not the facilities or location that makes it so special. It is Allison Wen.” Commitment to community, commitment to family, commitment to caring. That’s Allison Wen. No job – or event— is too big or too small for Allison to undertake including creating an annual special event, Salute to Fort Bend, designed solely to support worthy organizations in our community. When Ann Patterson Smith was five years old, she asked her mama and daddy for a baby brother for Christmas. “Now Santa was late that year,” Ann recalled, “but on January 20th, he delivered.” Fortunately for Fort Bend, Santa came through and gave Fort Bend a gift as well in James Patterson, a man who has served his community as an educator, an auctioneer, an elected official and an event leader. Thanks, Santa! A wise man once said, “It’s what you learn after you know it all that counts.” For this Man of the Year, the things that count are the most important in life – family, community and people. For nearly 40 years, John Null has cultivated a culture of giving in his accounting firm and in his life. “If you’re supportive, it causes others to be supportive,” said Null, who yes, is the wise man with a passion for adages as well as his community. Ho, ho, who? Why, it’s Mike Flory in that Santa suit bringing joy to children at Missouri City’s Snow Fest and to wounded soldiers from Walter Reed Army Medical Center in Washington D.C. and Brooks Army Medical Center in San Antonio. Through Impact a Hero, Flory brings the spirit of the season to soldiers and their families. “Everybody needs assistance at some time in their life, and the best exercise is to bend down and lift someone up,” said Flory. Ho, ho humble. Who roared into town in 2009 with a fast-paced passion for community service? The owner of Classic Chevrolet, Don Kerstetter. When Kerstetter brought the “Classic Chevrolet Difference” to Fort Bend, he brought it by community outreach. The list of community organizations Kerstetter has supported is endless, and he has made the “Classic Chevrolet Difference” in Fort Bend philanthropy. “Don has gone above and beyond what is expected of him,” said Sugar Land Mayor James Thompson. Yes, Fort Bend has relaxed and enjoyed the Classic Kerstetter difference. Radio personality and founder of the Snowdrop Foundation, Kevin Kline has stepped up for his community in a big way by caring for children with cancer. In December of 2009, Kline made national news by running from Dallas to Austin to San Antonio to Houston – 482 miles— in 13 days. “The purpose of that run was to raise awareness for pediatric cancer since only one cent of every dollar raised for cancer goes to pediatric cancer research,” said Kline. Run, Kevin, run. We’re on Team Snowdrop! Founded with the entire family in mind, the Sweetwater Country Club is conveniently located in Sugar Land. Activities range from casino night to dancing to how to save money for retirement. There are also a large number of activities for the kids as well, including organized sports competitions. You can also participate in one of the many Bingo games that are conveniently scheduled for its members as well. The SCC is also one of the most sought after locations for weddings and other scheduled social events. BAPS Shri Swaminarayan Mandir, Houston is a Mandir, or Hindu temple, located in Fort Bend County and was the first traditional mandir of stone and marble to be constructed in the United States. The mandir opened on July 25, 2004 after 16 months of construction. It was created entirely according to ancient Hindu architectural manuscripts known as the Shilpa Shastras. It is 25,620 square feet constructed entirely of marble from Italy and limestone from Turkey without any iron or steel in the structure. The stone that makes up the temple was shipped to India where it was hand-carved with traditional Vedic deities and motifs. Approximately 33,000 individually marked pieces were then shipped to Houston and assembled like a giant three-dimensional jigsaw. Whether you’re interested in priceless works of art or the fascinating bones of a tyrannosaurus rex, there is something for everyone at the Museum of Natural Science in Sugar Land. Even the building that houses the museum is interesting! The Main Unit of the Central State Prison Farm— which reopened as the Houston Museum of Natural Science at Sugar Land on Saturday, October 3, 2009 — and three barns were built in 1939 to replace existing wood structures on the older Imperial Prison Farm, which was located on the same grounds. The Skeeters play in the Atlantic League division at Constellation Field in Sugar Land, Texas. Beginning play in 2012, Constellation Field has a capacity of 7,500 spectators for baseball games. Of particular interest at the stadium is the scoreboard, which is one of the largest in minor league baseball. Designed by TS Sports, the scoreboard rises 100 feet above the field and was constructed to resemble the border of the great state of Texas! Established in 1991, family owned Bob’s Taco Station is known for being the best Tex-Mex restaurant in Rosenberg and the rest of Fort Bend County. The menu consists of specialty dishes, made to order tacos, and breakfast and luncheon plates. Featured on Guy Fieri’s Diners, Drive-Ins and Dives, their signature menu items include their homemade tamales, homemade tortillas, carne guisada, and hot sauce. Bob’s Taco Station is the place to be along the strip, and it’s not uncommon to see civic and community leaders waiting in line for the tremendous food available at this cultural landmark. Conveniently located on Highway 6 in Missouri City, the Star Cinema Grill has definitely raised the bar on what the expectation should be when it comes to going to the movies. Star Cinema Grill is a Houston-based dine in theater concept that offers its guests first run films, an extensive menu of food items, as well as a full service bar that provides its patrons with a wide selection of beer, wine and spirits. With its mission firmly in place of providing each guest with an unforgettable experience through unmatched service in a glamorous, Hollywood inspired setting, you will be wowed by everything you see and do at Star Cinema Grill. With over 300 employees at the Rosenberg plant, Frito Lay is very important within the community. Producing everything from Doritos, Tostitos and even Cheetos, the Frito Lay plant does everything from peel and bake the potatoes to the cooking and packaging of the items as well. The Rosenberg plant ships its homemade products all over the country in order to feed the nation with some of the most popular comfort food ever made. And it’s not just chips either. Frito Lay is responsible for Cracker Jack, as well as Grandma’s cookies. The Town Square is an inviting mix of Main Street activity that attracts people at all times of the day. The shopping, working and living all combine with making every opportunity more rewarding than the next, including the playing opportunities that exist for people of all ages. With a world-class hotel and restaurants that are truly outstanding, the Square is home to some of the nation’s most successful retailers and businesses. Sugar Land Town Square provides something for everyone in its pedestrian-oriented central business district. The Jester State Prison Farm is in Fort Bend County and is owned by the state of Texas and worked purely with convict labor. Originally known as the Harlem Prison Farm and Plantation, it consists of a number of Jester units that comprise the entire property. At one point in time, the farm contained over 5,000 acres and utilized a large portion of the prisoners to work and process the loading of the sugar cane from the sugar mill, which gave Sugar Land its name. Whether it’s a corporate meeting, an international dance competition, a consumer show, community theater performance or even a cultural festival, the Stafford Centre is a spectacle that should not be missed. Home to the Sugar Land Symphony Orchestra, the performance hall boasts a 1,100 seat performing arts theater, as well as a 90,000 square foot meeting facility. With over 28 acres of outdoor festival green space, the Stafford Centre has everything you could imagine, and then some! Opening in 1919 with the film Wanted for Murder, the historic Cole Theatre has been a landmark in downtown Rosenberg for over 90 years. For 64 years, the Cole had the distinction of being the longest continually operating theatre in cinema history when it closed in 1983. No films have been shown in the Cole since then, but that’s about to change with the purchase of the landmark by Imperial Arts. With a capital campaign and restoration underway¸ Imperial Arts is bringing life back to Rosenberg’s Cole Theatre, which is scheduled to reopen in 2014. In 1968, the Texas Department of Aging and Disability Centers (DADS) opened the first state supported living center in Richmond that serves people with intellectual and developmental disabilities who are medically fragile or who have behavioral problems. This living center provides 24-hour residential services, comprehensive behavioral treatment and health care including physician, nursing and dental services. Other services include skills training; occupational, physical and speech therapies; vocational programs and services to maintain connections between residents and their families. This facility is on 241 acres, home to about 390 people and serves a 13 county area. Southern history is alive and well in Fort Bend and Houston. Houston Baptist University has a museum that chronicles the south during the mid 1800s with displays of clothing, fine furniture, uniforms, tools and weapons. Southern National Bank of Sugar Land is home to the Confederate Museum that preserved artifacts and memorabilia. Also, a two story brick structure modeled after Thomas Jefferson’s retreat home, Poplar Forest. Exhibits include a handgun collection from the Civil War, a bell from the Union ship Harriet Lane, furnishings and clothing from the antebellum era, an exhibit of Terry’s Texas rangers, medical supplies and surgical instruments and authentic Confederate uniforms. Fort Bend Independent School District was formed on April 18, 1959 by the consolidation of the Missouri City and the Sugar Land Independent School District. A site was purchased on Lester Road and construction began on the first high school named after John Foster Dulles, a History Scholar who wrote 12 books and articles on 20th Century Brazilian History. In 1960, Fort Bend ISD had the first graduating class and continued to strive for education excellence by building more quality schools. At one time Dulles High School had over 4,000 students, but now the population is around 2,100. Today, Fort Bend ISD boasts 74 quality schools and is one of the largest districts in Texas. The Brazos River is the longest river in Texas and the 11th longest in the United States. Early Spanish Explorers named it “Rio de los Brazos de Dios” translated “the River of the Arms of God,” because the waters saved so many men from death. Every pioneer who came through Galveston followed the river to settle. This river runs 840 miles from Lubbock in west Texas and empties into the Gulf of Mexico. It was explored by some of the most famous men of the time: Cavelier and LaSalle. Today, the Rio de los Brazos de Dios is as vital to the public as it was over one hundred years ago. It is a source for power, irrigation, flood control, municipal use and recreation. In the early pioneer days, life was centered on the Brazos River. Transportation was a top priority. In 1888, a wooden bridge was constructed in Richmond to increase public travel from city to city. The early Brazos River Bridge was constructed without any standards or state regulations. Five years later, it collapsed and then was replaced with a sturdier steel structure. When the railroad came through Texas and ran through Houston to Missouri City, Stafford, Sugar Land, Harlem, Richmond, Rosenberg, Damon Junction, Randon, Wenzell, Tavner and on to Columbus, this bridge was used on a daily basis to continue growth and prosperity. Safari Texas Ranch, owned by Allison and Cassandra Wen, is a full-service facility on a 44 acre southern plantation setting that specializes in custom events. Established in 1997 and incorporated in Texas, the staff has over twenty years of experience to make any event one to remember. Ten banquet facilities are available with accommodations for 50 to 1,000 people. With seven ballrooms, Safari Texas Ranch will cater to weddings, ceremonies, galas, company picnics, corporate meetings and holiday parties. They also have exotic animals in the back of the property, which makes the ambiance of this setting an unforgettable experience. One of the oldest buildings in downtown Rosenberg, the two story brick structure was built in 1910 by Jacob Gray, then leased in 1912 by Louis Vogelsang who later bought the property in 1922 and opened a general merchandise store. A saloon was opened, and the Cochran brothers ran a law office and wagon, buggy and harness shop. Through the years, it has weathered storms, flooding and age. The building, built over one hundred years ago, still stands today and remains in the Vogelsang family. A restaurant, wine room, antique emporium, theater and ghosts complete the mystique of this historic building. Have you ever wondered what it was like to be a business woman at the turn of the century? In the world of exploration, a woman’s place was cooking, cleaning and having babies. Louise Ebell was one of the first settlers in Rosenberg. A widowed woman, she was courted by Major J.A. Carter in 1902, who later became the eighth mayor of Rosenberg. He built her a lovely home as a wedding proposal. She said yes and opened the first boarding house in Rosenberg. Charging $1 a night, the seven furnished rooms were rented often, although most of this small community lived in tents. Today it is owned by former Rosenberg Mayor Joe M. and Doris Gurecky and remains the oldest brick home in downtown. It is currently under extensive renovation. One of the oldest cemeteries in the area, this Richmond cemetery was named after William Morton, who was the first actual settler on the west side of the Brazos River. The land was granted to him by the Mexican Government in 1824 where he and his family resided. In 1825, a wounded stranger arrived on the property, Robert Gillespie, a fellow Mason. Morton erected a brick tomb over his grave that was said to be the first Masonic landmark in Texas. Morton disappeared during the flood of 1833, and his widow, Nancy, sold the land. Then in 1854, Michael DeChaumes acquired the burial ground and named it DeChaumes Cemetery. The Mortons reclaimed it in 1890, and the name returned to Morton Cemetery where today, it is the resting place of over 2,800 individuals. Early Texas settlers and their families buried here include Jane Long, “The Mother of Texas,” Mirabeau B. Lamar, the first Vice President and second President of the Republic of Texas; Walter Burton, a freed slave who served on the Texas Senate for seven years and Albert P. and Mamie E. George, benefactors of Fort Bend County. Texans have a reputation for making great barbeque. In 1957, Ed Dozier opened Dozier’s Grocery and Market in Fulshear introducing the community to the tastiest barbeque around. People from all over the area make the drive to sample their delicious brisket, pork ribs, sausage, beef, turkey, ham and chicken. Patrons such as politicians, celebrities, sports figures and townsfolk still savor the 50-year-old recipes. Today the menu and the place are the same as in 1957. “If it ain’t broke, we don’t fix it” is their motto. The restaurant is owned and operated by Scott and Smedley Evans. Fort Bend is the fastest growing county and number one in population growth according to the 2010 U.S. Census Bureau. 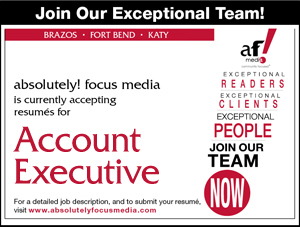 Forbes February 2010 places Fort Bend as number one on the “Best Places to Get Ahead” list. With the reputation of regional leader in household income, Fort Bend is becoming a popular suburb of Houston for residents to live and work. Number one in employment growth in the United States, Fort Bend ranks fifth of the top 20 master communities in the nation and is top 10 in the nation for economic strength. It is third in the nation among fastest growing counties with a population of over 200,000, according to U.S. Census Bureau 2007. Remember Happy Days? The soda shop where the Fonz and Richie went to eat burgers is a short drive away. Renee Butler has been the owner for nine years, but the ambiance of this charming restaurant is much older. Consider the 103-year-old building it resides in. Originally, it was a Land and Loan Company. In the early 1900s, it became Ed’s Pharmacy and Soda Fountain. Eventually, it became an antique store and soda fountain. When Butler took over, she gutted it to expose the original walls and left the rustic look of age. The vintage knick knacks complete the time travel atmosphere. Oh, and the food is good, too! In 1843, Stephen F. Austin came to Sugar Land with 100 families to commission the first Sugar Mill. The oldest successful business in Texas to this day refines raw cane sugar and blackstrap molasses. Around 1879 E.H. Cunningham acquired most of the land and built a large sugar refinery. This plantation survived the Civil War and in 1906 Isaac H. Kempner and partner William T. Eldridge purchased the 5,300 acre Ellis Plantation. The adjoining 12,500 acre Cunningham Plantation was purchased in 1908, which had a raw sugar mill and cane-sugar refinery. The partnership agreed to the name “Imperial Sugar Company” associating the name with the Imperial Hotel in New York. Loyal employees are crucial to the success of a company. From 1906 through 1930, Imperial Sugar Company made available books of coupons and aluminum coins for employees to spend at the company store. Most of the time the money was used for workers who needed an advance in wages; they were issued coupons or coins for the sole purpose of spending the money at the local store. The company was repaid every time because the employee signed an agreement that the company could deduct the value of the coupons from the next wages. The founding fathers, Kempner and Eldridge, had the foresight to do the things necessary to keep quality employees. In 1824 on the east bank, Capitan William Hall and Capitan David Fitzgerald bought land and began farming at Sienna Plantation in Missouri City. Fitzgerald died, and the Plantation was sold to J.B. Capels. Jonathan D. Waters from South Carolina arrived in 1840 and set out to acquire the claims of Hall and Capels. By 1860, Waters Plantation was a 6,500 acre farm of sugar cane, cotton and other crops. War and debt forced the land to be bought and sold. Finally in 1908 T.H. Scanlan assumed ownership of the property, and after his death, his two remaining daughters Lillian and Stella, dismantled their home in Houston, and rebuilt it on what they named Sienna Plantation. Today, Johnson Development’s Sienna Plantation is a 7,000-acre master-planned community with an impressive amenities list including three resort-style water parks, two additional community pools, a lakeside amphitheater, lighted tennis courts, playgrounds, a world-class fitness center, a golf course and the Camp Sienna sports complex. Boasting 2,530 acres of beautiful land nestled along Oyster Creek, Quail Valley was the first master planned community in Fort Bend County. Started in 1969, this scenic land is the center for Missouri City’s tremendous growth. J.H. MacNaughton, a developer with ambition and foresight, purchased the property with intentions to build a golf course subdivision. By 1970, the first family moved into the area. Thirty years later, Quail Valley is comprised of 4,115 homes with a population of over 12,000. In 1973 and 1974, the Houston Open Golf Tournament was hosted there, and recently, the course was renovated as a public golf course accompanied by a public community center, the City Centre at Quail Valley, owned and operated by Missouri City. Purchased by the state in 1976-1977, this Needville park covers roughly 5,000 acres and was opened to the public in 1984. This land was a part of the early settlers passing through several landowners. Amazing artifacts still remain including a brick cistern, built with slave labor and rustic cabins. Located on the southeast border of Fort Bend County, the Brazos River is a haven for over three hundred species of wildlife including migratory birds, armadillos, raccoons, river otters, white tail deer and notably alligators. Patrons come to fish, camp, bike ride, walk and picnic and experience the Nature Center and the George Observatory. The park is run by the Texas Parks and Wildlife Department. Now called Sugar Land Auditorium, this historic auditorium is the property of Fort Bend Independent School District. In 1918, Imperial Sugar Company designed a beautiful auditorium adorned with intricate details and quality wood work for the purpose of community gatherings from band concerts to watching silent movies. Unfortunately, the test of time left the building neglected and deteriorating as it sat empty for many years. Sugar Land Cultural Arts Foundation took notice. With extensive fundraising, renovation began to take place. Today, it is revitalized and used by many community organizations and Sugar Land schools. In 1993, a historical marker from the Texas Historical Society was awarded to protect this historical treasure. In business for over 60 years, Herfort Diamond Ring Factory in Rosenberg specializes in designing and customizing rings and jewelry. The business began with John Herfort, who came from Berlin, Germany as a watch maker and moved to Houston to work. He noticed that many Railroad watches were brought in by people from Rosenberg and Richmond. He decided to move to Rosenberg where he opened a small business at the Old Texas Motel. He found a small building for rent and began selling watches, china, silver, and rings. In October of 1960, John and his family opened the same building that stands today. John passed away in 1988, but his wife and children still work there to keep his dream alive. This breathtaking Richmond home was built by John Moore and his wife, Lottie Dyer Moore, the year they married, 1883. Lottie’s relatives were a part of the original colonists who came to Texas with Stephen F. Austin, and she inherited the land after they passed away. The home was designed by Thomas Culshaw and still stands majestically today as a Victorian four bedroom, two story mansion with a center tower and cupola. The First Baptist Church of Richmond was founded in the home until a building was built in 1889. Through the process of time the home was remodeled and updated to accommodate interior improvements. Today the property is deeded to the Fort Bend County Museum Association. Preserving history is an obligation society has to future generations. George Ranch Historical Park takes visitors back over one hundred years to 1824 when Texas was still a part of Mexico. Viewing the 23,000 acre working ranch is overwhelming, and several farms are still a part of the landscape. The 1830s Jones stock farm is still working with crops, livestock and weaving demonstrations. View the 1860s Ryan Prairie home and the 1890s Davis Victorian Mansion, a sharecropper’s farm, and witness a working blacksmith shop. There is even a family cemetery. The 1930 George house is filled with original furnishings, barns and working pens. History is alive and well at George Ranch. Great things begin with simple ideas. In 1986, Haley’s Comet glazed through the sky, and 7,000 people traveled to Brazos Bend State Park to watch in amazement. A man named Leonard Patillo and the Houston Museum of Natural Science decided they needed to purchase a telescope that would be easily accessible to the public. Many meetings and discussions were held until finally they were notified that LSU had a telescope they could purchase. The Fort Bend Astronomy Club helped raise the funds for three domes to be placed at Brazos Bend State Park. By 1994 it was a reality. They named it George Observatory, a nonprofit organization dedicated to astronomy by teaching, sharing and observing. One of the last remaining Sugar Plantation buildings of its kind, the two story Victorian home dubbed the Dew House was built by Dr. Hugh Saunders Dew around the 1900s. He left his medical practice in Thompson, Texas to become a businessman. With his father, Thomas Tristan Dew and brothers, George and Henry, they raised cattle, sugar cane, cotton and corn. The Dew brothers took advantage of the Imperial Sugar Company opening in Sugar Land by shipping the sugar cane to the refinery. They also began a new business venture creating the Dew Brothers Syrup Company. They are considered part of the founding fathers of Missouri City. The Dew Plantation is still in the family to this day. It is open to the public as a reminder of the accomplishments of the past. Dr. Donald “Doc” Hull was an oral surgeon in the early 1950s for the Texas Department of Corrections providing dental care at prison units. He grew frustrated with the commute when the major airports forced his closure. In 1952, Doc Hull landed his biplane in a cow pasture near Sugar Land and later purchased the land with a loan from a friend. He opened “Hull Field” and invited other pilots to use the air strip and founded Hull Aviation. He continued to improve it by paving and extending the runway. The airport gained public recognition and in 1990 the city of Sugar Land purchased the airport as a self-sustaining enterprise. In October 2002, a new name was given to this little idea that grew big, Sugar Land Regional Airport. Transportation is the key to the growth of society. The city of Rosenberg has preserved the rich history of the railroad industry in Fort Bend with the Railroad Museum. Modeled after the original depot, the museum takes you back to the years 1883 through 1913 when the Santa Fe and Southern Pacific railroads were the only major form of travel. View the maps of the journey the railroads took daily. Observe the cases of memorabilia of days gone by, artifacts of the people who ran and lived on the railcars. Stroll through a Caboose and a railcar exquisitely decorated to take you back in time. A miniature train set is meticulously set up with detailed cities to enhance the effectiveness. The Rosenberg Railroad Museum has the best visual history around. Hosted by the Fort Bend Chamber of Commerce and the Conrad Hilton College of Hotel and Restaurant Management and attracting more than 7,000 fanatic foodies annually, the Grand Wine & Food Affair is recognized as the most anticipated culinary attraction of the year. Located in historic Sugar Land just 15 minutes from Houston proper, its tastings, dinners and seminars have achieved a reputation as a rollicking good time. It is a place where top chefs share secrets, sommeliers get uncorked and you have exclusive access to the best wine and food around. Located each year at the George Ranch in April and benefiting the American Cancer Society Houston Chapter, the Cattle Baron’s Ball is definitely worthy of your attention. Having given over $33 million dollars to the local American Cancer Society to date, the Victory organization behind the Ball definitely does its share of work towards reaching their goal of eliminating cancer as a major health problem through prevention, saving lives and diminishing the suffering from cancer through research, education advocacy and service, a truly noble cause for everyone. On December 4, 2012, Congressman Pete Olson of Texas District 22, addressed the House of Representatives to introduce the American people to Kevin Kline. Kline had just been announced as Fort Bend Focus Magazine’s Man of the Year, and Congressman Olson stated that Kline earned that honor because of the Snowdrop Foundation, an organization he and his wife, Trish, created to help children fighting life-threatening cancer. Olson spoke of Chelsey Campbell, Kline’s inspiration for Snowdrop Foundation, and thanked Kline “for sharing Chelsey’s story with me so I could enshrine her life forever in the Congressional Record of the United States of America.” Olson wrote a personal note to Fort Bend Focus publishers Michael and Lisa Fredrickson thanking them for naming Kline as the Man of the Year. A copy of the CongressionalRecord along with Olson’s personal note hangs proudly in the offices of absolutely! focus media. Thank you, Congressman Olson, for representing us in all matters and for taking the time to read and care – about your constituents. On an early December morning in 2010, Sugar Land shook when two metal buildings at the historic Imperial Sugar Company refinery located on Highway 90A in Sugar Land were imploded to make way for Johnson Development Corporation’s newest project: Imperial. Two metal buildings came down, but the historic char house, an icon of Sugar Land, remained part of the project. The demolition was coordinated by D.H. Griffin of Texas, Inc., one of the nation’s foremost demolition and dismantling contractors, and ESE Partners, LLC, the project’s environmental engineer. An official viewing area was set up along Highway 90A and t-shirts were sold to commemorate the historic event. The first Fort Bend County Fair (FBCF) was held back in 1933 and since that time, the FBCF has grown into one of the largest and most successful fairs in the state of Texas. The fair is historically important as well, as the fairgrounds were originally located between Richmond and Rosenberg but have been in its current location since 1974. The focus of the fair has always been youth education, having provided 30 scholarships annually to deserving Fort Bend County students. Joyous, Extraordinary Women Enriching Lives – selected because of their commitment and service to the Fort Bend community. The event officially presented the JEWELS and featured a style show, luncheon and raffle. For the past five years, Fort Bend Focus Magazine Honors the JEWELS of Fort Bend has benefitted six community organizations: Fort Bend Lawyers Care, East Fort Bend Human Needs Ministry, Rosenberg-Richmond Helping Hands, Fort Bend Seniors Meals on Wheels, Literacy Council of Fort Bend County and CASA de Esperanza. Through this event, Fort Bend Focus Magazine has donated over $100,000 to these non-profits. The Arc of Fort Bend is a group of people whose vision is to be advocates for the special needs of all people with disabilities from birth to death. They are a privately funded non-profit organization and fundraising events are a necessity. “The Best of the West” event began in 1976 and is one of the largest in Fort Bend drawing on average 1,200 generous patrons each year. To commemorate 35 years of service, this “Quality of Life for All” celebration was held at George Ranch Arena on November 17, 2012 and chaired once again by Commissioner James Patterson, Ann Smith and Jo Ann Stevens. The trio has headed up the event since the mid 1990s. The dance is filled with live and silent auctions, a band and delicious food. For the past five years, the event has raised approximately $300,000 each year. The Sugarland Express is a 1974 film that starred Goldie Hawn and Ben Johnson. The film was directed by Steven Spielberg and was his directorial debut. The film was based on a true story centering on a couple, Fae Holiday and Robert Dent, who were trying to outrun the law after the wife helped the husband escape from the Beauford Jester Prison Farm in Sugar Land. Setting the foundation for Spielberg’s brilliant career, The Sugarland Express also showcased the beautiful scenery of Fort Bend County. According to the National Center for Charitable Statistics, there are approximately 1,600 registered nonprofit organizations public – charities, private foundations and others in Fort Bend County. The list is much diversified. There are over 100,000 non-profit organizations in Texas. These registered groups have generated millions of dollars to benefit a wide range of public needs. Fort Bend has a reputation for generosity and compassion. Foundations are established to assist in all levels of funding. From education, housing to medical, our people look for ways to be instrumental in helping their fellow man. Debuting on October 1, 2011, the Fort Bend Chamber of Commerce sponsors this innovative event every Saturday all year from 9 am to 1 pm. Patrons come from all over to purchase local produce, specialty foods, enjoy children’s activities, live music, cooking demonstrations, artisans, craftsmen and a morning of overall fun. The Chamber has cleverly placed the market in front of the Imperial Sugar Silos and historic Char House. In 2006 the City Council of Sugar Land designed the redevelopment of Imperial property to enhance the area and entice the public to make the Farmers Market at Imperial a destination point for all Fort Bend and Houston residents. 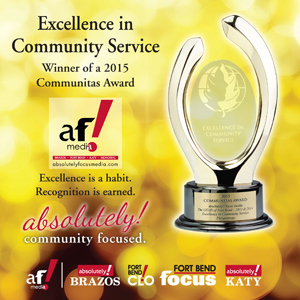 “Women Making a Difference” is the motto by which the members of Fort Bend Service League live. Founded in 2001, the league has grown from 24 charter members to a dedicated 250. These leaders contribute many service hours to benefit charities as well as volunteer in a mentoring program for teens, which is extraordinary. But, perhaps their most famous activity is the annual Sugar Plum Market held every November to raise money for charitable community organizations. “Shop ‘til you drop” is the motto of this annual event held at the Stafford Centre that kicks off the Holiday season. With a Thursday night preview, the market is open Friday and Saturday. Vendors book well in advance to be a part of this well-organized and successful fundraiser that has given away hundreds of thousands of dollars to deserving community organizations.